Two-dimensional materials called molecular aggregates are very effective light emitters that work on a different principle than typical organic light-emitting diodes (OLEDs) or quantum dots. But their potential as components for new kinds of optoelectronic devices has been limited by their relatively slow response time. Now, researchers at MIT, the University of California at Berkeley, and Northeastern University have found a way to overcome that limitation, potentially opening up a variety of applications for these materials. The key to enhancing the response time of these 2-D molecular aggregates (2DMA), Fang and his team found, is to couple that material with a thin layer of a metal such as silver. 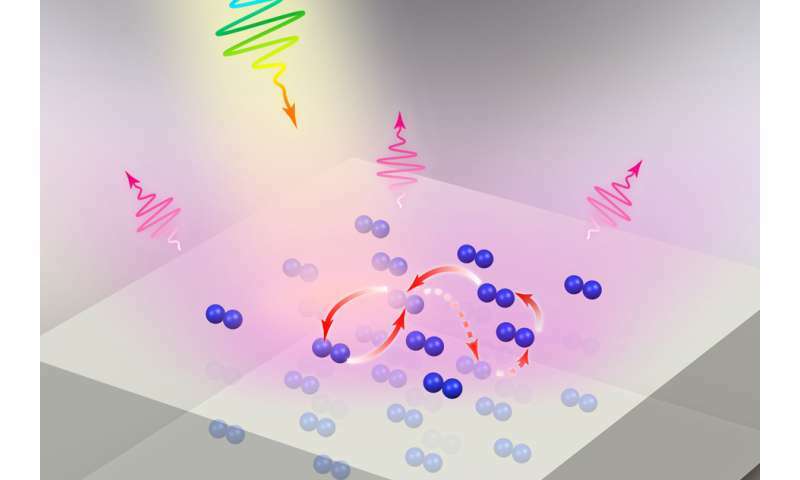 The interaction between the 2DMA and the metal that is just a few nanometers away boosts the speed of the material's light pulses more than tenfold. In order for these materials to be useful in devices such as photonic chips—which are like semiconductor chips but carry out their operations using light instead of electrons—"the challenge is to be able to switch them on and off quickly," which had not been possible before, Fang says. With the metal substrate nearby, the response time for the light emission dropped from 60 picoseconds (trillionths of a second) to just 2 picoseconds, Fang says: "This is pretty exciting, because we observed this effect even when the material is 5 to 10 nanometers away from the surface," with a spacing layer of polymer in between. That's enough of a separation that fabricating such paired materials in quantity should not be an overly demanding process. "This is something we think could be adapted to roll-to-roll printing," he says. If used for signal processing, such as sending data by light rather than radio waves, Fang says, this advance could lead to a data transmission rate of about 40 gigahertz, which is eight times faster than such devices can currently deliver. This is "a very promising step, but it's still very early" as far as translating that into practical, manufacturable devices, he cautions. The team studied only one of the many kinds of molecular aggregates that have been developed, so there may still be opportunities to find even better variations. "This is actually a very rich family of luminous materials," Fang says. Because the responsiveness of the material is so strongly influenced by the exact proximity of the nearby metal substrate, such systems could also be used for very precise measuring tools. "The interaction is reduced as a function of the gap size, so it could now be used if we want to measure the proximity of a surface," Fang says. Fang says a first prototype of a device using this system might be produced "within a year or so."